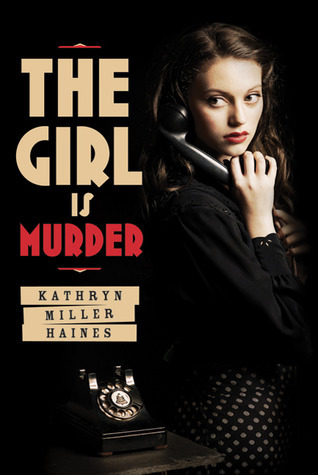 The Girl Is Murder is a book for lovers of historical fiction or lovers of mysteries. The basic plot lines: girl playing detective to discover the whereabouts of a missing classmate; being the new girl at a poor public school; making and keeping friends; coming to terms with mother's suicide; dealing with decreased financial circumstances; developing relationship with previously absent father. While the story is set in 1942, the plot lines aren't unique to that time period - they could have occurred 500 years ago or yesterday. Moreover, the plot isn't particularly unique. But it's the 1942 world that sets the book apart. There aren't that many books set on the homefront during World War II. And unlike most stories set in this time period, the War isn't the main focus. Haines does a wonderful job of immersing the reader into 1942 culture. While the War isn't a main character, cultural 1942 is. I loved seeing what a teenager in 1942 wore and listened to on the radio. Some aspects of Iris's life is unique to New York City, which is interesting in and of itself. Class, race, and national origin were very important in those days (they are perhaps equally important today but people are more subtle in their snobbery). We see a strong contrast in mannerisms, lifestyle, and dialogue between Upper East Side and Lower East Side New York City. The strongest indication of the past in this book is the use of slang. It's everywhere. Particularly with Iris's friend Suze, hardly a sentence goes by with some 1940s phrase. This was fun at first, but it gets old. It's frustrating when all of the dialogue is slang. Granted, many characters do not use slang all the time, but there is still so much of it that the reader ends up rolling her eyes at the fake sounding dialogue. Did people really talk that way? On the bright side, I did think it was interesting that Iris's use of slang increased the longer she was around her Lower East Side friends. It was an interesting way to show her development from Chapin girl to P.S. 110 girl. The mystery element is quite good. This coming from someone who doesn't like mysteries. There were plenty of twists and turns, red herrings, and villains. I was quite surprised by the end result. That's not saying much though, because I'm horrible at guessing the solution to a mystery. However, there were an awful lot of coincidences. Tom, the missing boy, had an extraordinary amount of connections to Iris's new and old life. A really good mystery is both fun to read and believable. I quite enjoyed seeing "whodunnit," but I didn't believe the story. I liked Iris as a character. If you weren't inside her head, you'd think a lot of her actions were despicable: she double crosses and lies to everyone - her friends and her father. She jumps to conclusions, she is incautious, and somewhat naive. But seeing all these actions and character traits from Iris's point of view, I sympathized with her. I understood why she did the things she did and realized that her intentions were generally good. The Girl Is Murder is another one of those stories where you can enjoy the story if you leave your mind behind. Numerous things bothered me: the slang, the coincidences, some poorly developed plot lines. But I quite enjoyed the book. It is a very quick read. The plot flows smoothly. The mystery element supports the historical fiction element and vice versa. I loved learning more about a time period that is relatively unfamiliar to me. It's certainly not perfect, but The Girl Is Murder is a worthy read. Great review. I haven't heard much about this book but it sounds pretty good. Thanks for sharing. I've seen this book around, but haven't really read many reviews. I love historicals centered around WWII so I should check this one out - sounds good! This sounds promising. I've often encountered books with annoying slang - when I read Aussie books especially - so I've gotten used to just ignoring it. Great review I'll have to check this one out! Great review.I dont really like historic books set around this time period but I may give it a try anyway. I think I would like to try this one. It sounds like a book I might enjoy. Thanks for the honest review. The slang would definitely get old. I get that some phrases and things are right for the time period, but slang always tends to pull me out of a story. Glad the mystery was a success though, I love some good twists and turns that keep me on my toes. Fantastic review Alison! I need me a quick read! I loved Veronica mars so I may check this one out. Though I am not a fan of unbalanced plot lines. I really want to read this one! I adored Nancy Drew growing up, and I've loved teen mysteries ever since. Plus, the cover is so awesome (I wanna know where I can get that lipstick!). The slang thing seems kinda annoying, but hopefully I'll be able to ignore it. Thanks for the review! I'm on the fence with this one. I don't like having to leave my mind behind but I like books set during WWII. I haven't heard much about this book, and honestly I've been kind of meh toward it because I'm not drawn to the cover. Your review makes me think I should reconsider. I like the way the mystery sounds and how there is immersion into the 1940s but the focus isn't the war (how unique! ), but the slang and coincidences would probably annoy me too.